It isn’t surprising but I will say it; this book is phenomenal. If you aren’t already familiar with Jonathan Abram’s work with the Los Angeles and New York Times or the late Grantland, it would probably be in your best interest to hit the archives. Abrams is a talented writer that has proven time and time again that he knows his basketball and his experience as a journalist in the internet era helped shape just how good he is at sharing others’ stories. Athletes leaving high school and heading straight to the National Basketball Association is a particularly unique issue to write about because of its ongoing yet finite timeline. The book, of course, includes the beginning when Moses Malone, Darryl Dawkins and Bill Willoughby became the first players to make the jump in the early-mid 1970s but the ending isn’t as clear. In 2016, it has been years since retired basketball commissioner David Stern implemented a minimum age requirement that ensured every new draftee would be at least one year removed from their high school graduation. 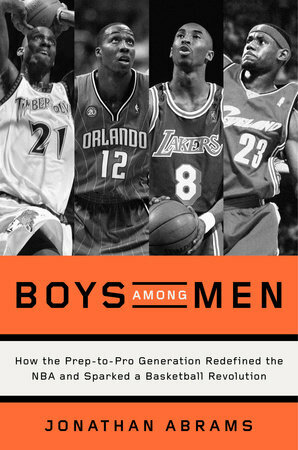 However, plenty of the book’s main subjects including LeBron James, Dwight Howard and more are still playing; the story isn’t over. If I had to guess, I believe that I do know how Abrams feels about the surge of young players in the NBA and the complex issue at hand but the author represents both sides very admirably. There is no clear-cut answer because a different set of priorities will yield a best case scenario. What is best for the NBA’s competition levels is neither the fairest policy for individuals to make a living nor the most cost-effective payroll for team owners. With agents, shoe companies, opportunists and altruistic mentors in the mix, a single answer that appeases everyone seems almost impossible. Abrams covers the major accounts that the average basketball fan will remember such as those of superstars LeBron James, Kevin Garnett and Kobe Bryant in addition to many lesser known and untold stories. I learned a lot and I’m a basketball-loving information junkie. Without giving too much away, the chapter near the end that focused on agent Arn Tellem and provided comparative statistics about college experienced players versus those that made the leap was particularly convincing. Lastly I would like to give more credit to Abrams for the fashion that he sourced popular news outlets throughout the book. Interviews are great. Very little can beat hearing what people who were actually present think about a situation in hindsight. That being said, nostalgia and passed time can certainly affect the memory, especially a controversial or heated issue where not only individuals but the mainstream attitude may have shifted from where it was at the time. By giving direct quotes and summarizing the various journalists of the time, Boys Among Men allows us to see the true feelings of the people involved. A must-read!